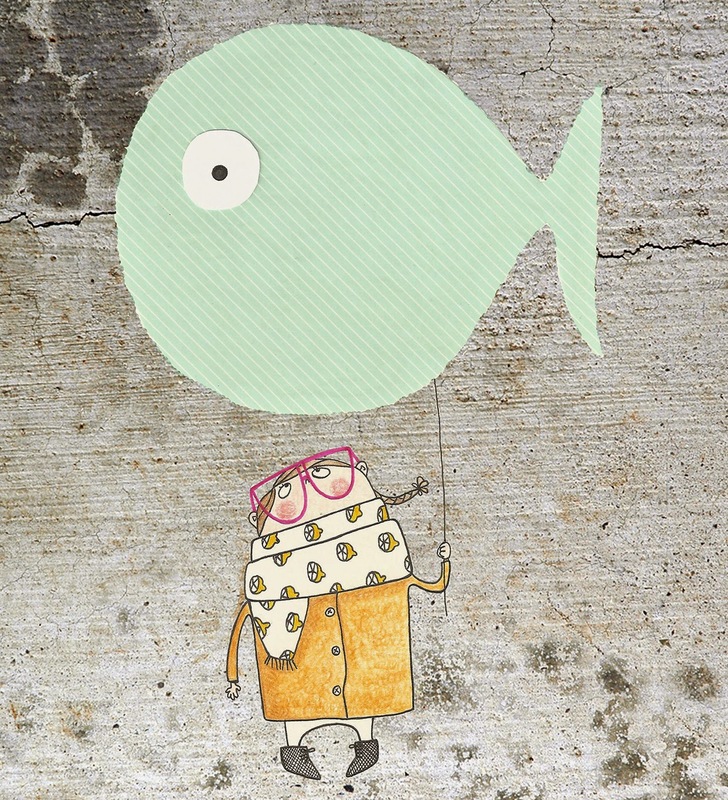 Bonbonbox Illustrations: 52 Week Illustration Challenge Art Exhibition: "The Giant Fish Balloon" goes to Perth! 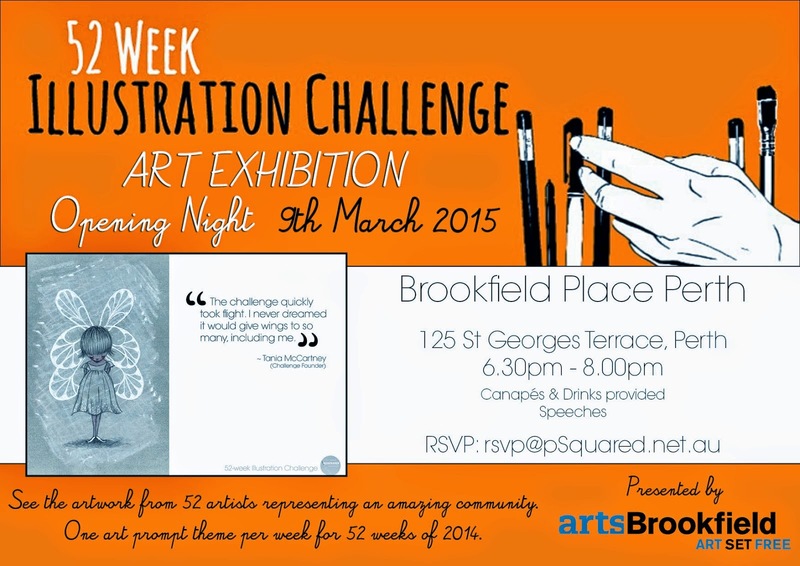 52 Week Illustration Challenge Art Exhibition: "The Giant Fish Balloon" goes to Perth! "The challenge quickly took flight. I never dreamed it would give wings to so many. Including me." I love this quote by Tania MacCartney. It describes so beautifully my feelings at this exact moment. 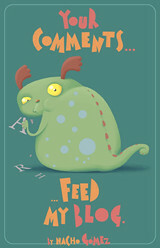 When I first read about the "52 Week Illustration Challenge" I thought: this is fun! I liked the idea of challenging myself with a new theme every week and I liked to be part of a group of incredible people from around the globe, sharing the same enthusiasm for art. I loved to see the artworks being posted day after day, each of them so unique. The group was all about creating and sharing and it was a wonderful experience. I think none of us thought that the group would grow so much to include more than 3.000 members and certainly none of us was expecting the big news received in June: an exhibition showing 52 artworks, one for each week, would be held at the Brookfield Place in Perth, Australia, from the 9th to the 22nd of March! The artworks would be selected by Tania and co-admin and super talented illustrator Nicky Johnston and only revealed to public the 9th of March! When I was informed that "The Giant Fish Balloon" had been selected among so many beautiful, incredible artworks, I literally jumped for joy. It was a true, huge honour. My little girl with funny pink glasses holding a giant fish balloon was flying to Australia! 2014 was a year full of changes and big surprises. It was one of the thoughest year of my life in terms of changes to face and decisions to make, but it was also the most beautiful one. It was the year I experienced the biggest joy: becoming a mum. The year I decided to quit a secure job I had done for years to follow my dreams. The year I decided to challenge myself with lots of new things. In the middle of this, came the 52 Week Illustration Challenge, which started as fun and turned into something great. Thank you Tania for giving us the opportunity to challenge ourselves and create beautiful things. Thanks to you and Nicky, for choosing my little girl and her giant fish balloon. Yes, I do see a bit of myself in the small girl facing this big (but fun and colorful!) balloon, and wondering: shall I take the flight?